Living on campus is a wonderful opportunity and can be a great experience for many students. 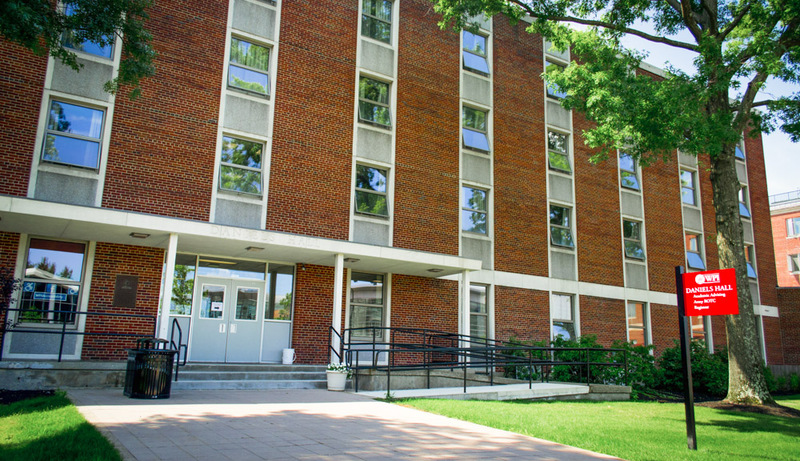 We want your residence hall, whether large or small, to become your home away from home, while also providing a sense of community, friendship, growth, learning outside the classroom, leadership opportunities, and fun. As a resident, you'll be within easy walking distance to classrooms, dining halls, the Sports & Recreation Center, and campus activities, and will gain a greater sense of connection with the university and with the people you will meet. You'll also have access to Wi-Fi, cable, movie streaming services, study lounges, and more. Our hope is that living on campus provides you with an experience you can look back on and realize how much you have learned and grown, both academically and socially. Sure, living on campus is convenient, but did you know research suggests students who live on campus are more satisfied with their college experience, do better in class, and are more likely to graduate? That’s just one of 10 reasons to #LiveWPI. One key element to a successful on-campus residential experience is the willingness to get involved. You can have an impact on the direction of your hall, and WPI, through your participation in activities and leadership opportunities, from becoming a Resident Advisor (RA) to serving on the Residence Hall Council. The programs and activities in the halls are designed to promote interaction among residents, assist students in meeting each other, offer students an opportunity to learn about a variety of topics, and help students learn more about themselves and each other. National Residence Hall Honorary (NRHH) is a nationally recognized leadership and service honor society that recognizes the efforts of members of the WPI community through monthly awards and works to provide service projects that directly benefit the WPI and Worcester communities. NRHH provides recognition of exceptional student leaders and members of the WPI community. This honor society celebrates the top one percent of residential student leaders on campus. In compliance with the Higher Education Opportunity Act of 2008 (the HEOA), WPI is providing students with the opportunity to identify a Confidential Contact Person. In addition to registering an emergency contact, students have the option to identify confidentially an individual to be contacted by WPI in the event the student is determined to be missing for more than 24 hours. Please use this form (PDF) to list your confidential contact(s); forms may be returned directly to Residential Services or your Resident Advisor (if you have one). The Residence Services office is committed to providing students with disabilities an equal opportunity to access its residential community. We partner with the Office of Disability Services to provide reasonable accommodations for students with medical, physical, or psychological conditions.